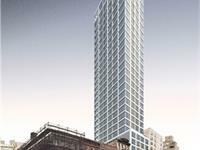 currently under construction at 368 3rd Avenue, New York. The development is scheduled for completion in 2022. 368 Third Avenue has a total of 100 units. Situated in proximity to Gramercy Park, this project is located in one of Manhattan’s best neighborhoods. The project will be an approx. 145,000sf mixed use luxury retail and residential condominium development with breathtaking views of the Manhattan Skyline and East River from the 34th Floor rooftop. Close proximity to transportation, shopping, business. Your inquiry will be delivered to the developer / builder of 368 Third Avenue, who will send you more information about this development.